NASHVILLE – MTSU exits another weekend of conference play with a sweep, this one coming against Charlotte in comeback fashion. The Blue Raiders will search for similar success in non-conference play, with MTSU posting a lackluster 1-8 record in midweek non-conference games to this point. 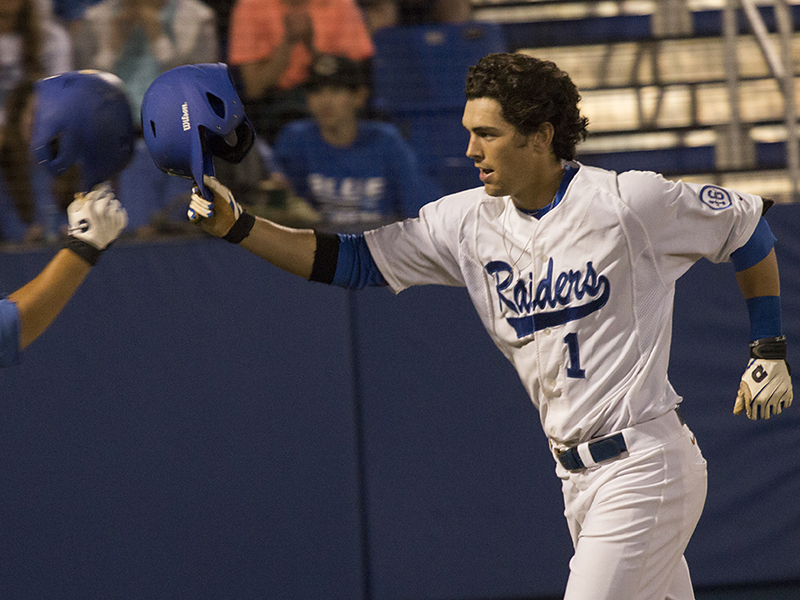 That lone midweek victory came against SEC foe Tennessee, a 7-5 win for the Blue Raiders. MTSU coach Jim McGuire and the Blue Raiders (23-16, 14-4 C-USA) will travel to Nashville for another SEC matchup, this time in a rematch against No. 8 Vanderbilt on Tuesday night. The Blue Raiders and Commodores faced off earlier in the year at Reese Smith Jr. Field on March 24. MTSU led by as many as four in the game, and found themselves ahead 7-5 heading into the eighth. Just six outs away from a win against then-No. 2 Vanderbilt, the Commodores (29-12, 12-6 SEC) showed why they deserved that ranking. The defending champions found their power in the eighth with Karl Ellison and Jeren Kendall hitting back-to-back home runs to tie the game. The Commodores put five more runs on the board to close out the 12-7 win over the Blue Raiders. MTSU holds a 10-7 record since their last matchup against Vanderbilt, but still sit atop C-USA with a 14-4 record in conference play. Tuesday’s matchup is the 84th all-time meeting between the two teams with the Commodores holding a 59-24 edge over Middle Tennessee. The Blue Raiders’ last win over the Commodores came on March 20, 2013 in Murfreesboro. Vanderbilt has won 11 of the last 12 meetings between the two teams. The Commodores have been less than stellar since facing off against MTSU, posting a 9-7 record while losing series’ to SEC opponents South Carolina and Ole Miss. Tuesday’s contest against Vanderbilt is one of four remaining midweek games for the Blue Raiders, and a crucial one at that as they ride a six-game win streak towards the back end of their schedule. The Blue Raiders’ remaining midweek opponents are Vanderbilt, Lipscomb, Tennessee Tech and Belmont, all of whom have beaten MTSU this season. The Blue Raiders also have four weekend series contests left in C-USA before the conference tournament. MTSU hosts both Western Kentucky and Southern Miss, while traveling to Marshall and UTSA. MTSU junior righthander Garrett Ring (1-1) will get the start for the Blue Raiders against Vanderbilt lefty Ryan Johnson (3-0). First pitch between Middle Tennessee and Vanderbilt is slated for 6:30 p.m. CT from Hawkins Field.